Easter will be popping up in less than a month and I can hardly believe it. With local events, springtime dinners, and celebrations upon us, I’m sure most of you are already busy planning. It’s time to break out the fluffy tailed bunnies and cute little chicks! 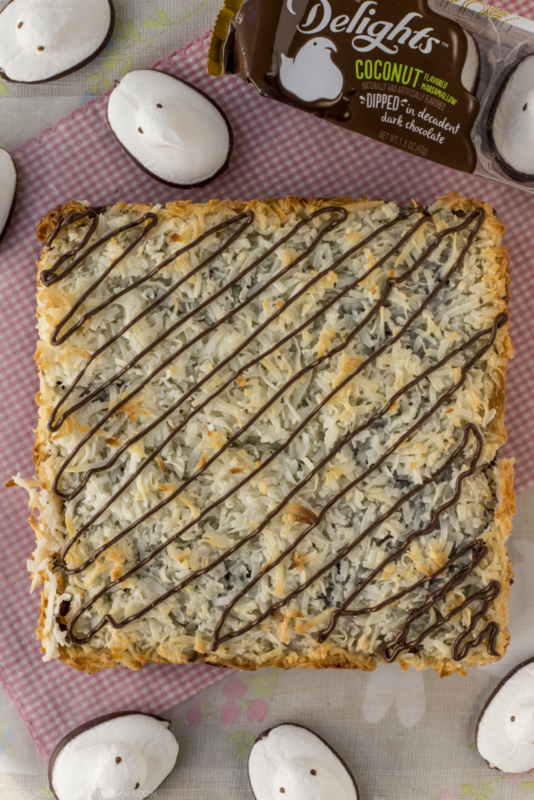 We’re right on schedule with that idea and today I’m sharing how to make PEEPS® Coconut Macaroon Brownies to sweeten up your dessert display this season. Marshmallow PEEPS® always dominate my holiday recipes and for good reason too. I have yet to hear anyone complain about having marshmallows coated in sugar crystals on top of their cupcakes or cookies. You can stick those things on anything and they’re sure to make it taste spectacular. 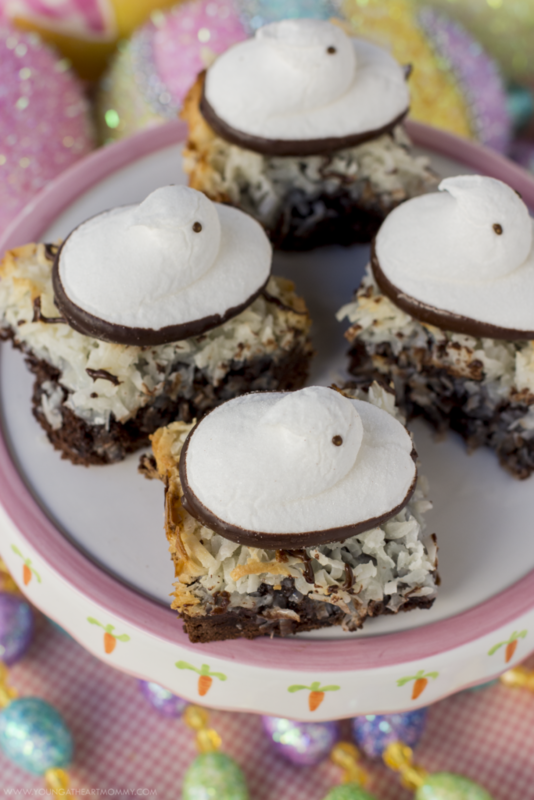 Decadent brownies combined with fresh coconut, fluffy marshmallow and rich dark chocolate make for one delightful springtime treat. 1. Heat oven to 350°F (325° F for dark or nonstick pan). 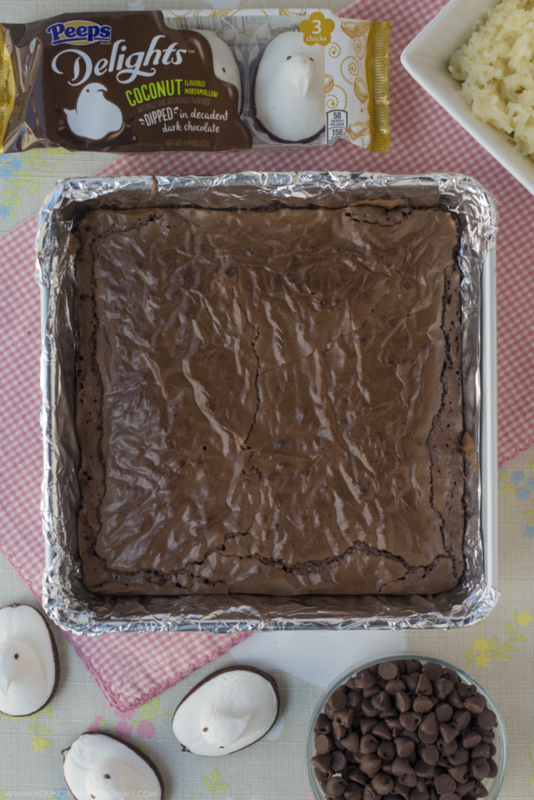 Line 9×9-inch square pan with foil, leaving extra hanging over the sides of pan and spray bottom only with cooking spray. Make brownie batter as directed on brownie mix box. Spread batter in pan and bake 36 to 38 minutes or until toothpick inserted 2 inches from side of pan comes out almost clean. 2. In medium bowl, mix coconut flakes, sweetened condensed milk and almond extract. 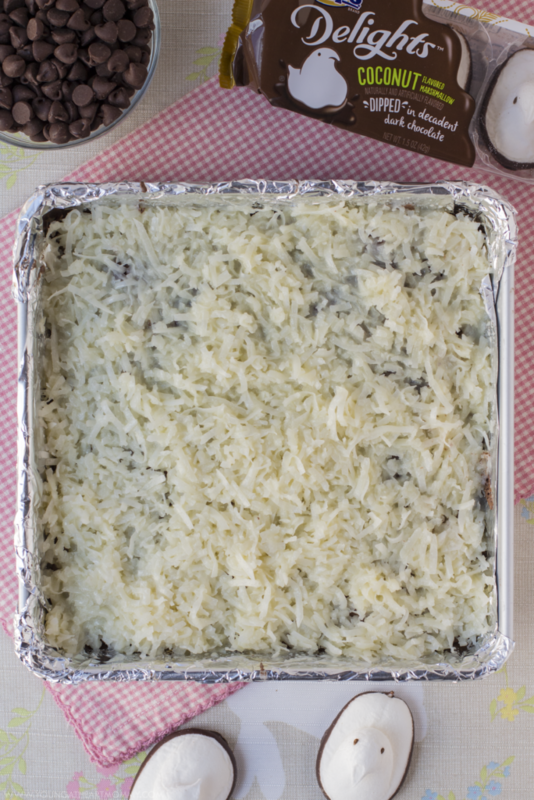 Remove brownies from oven and carefully spoon and spread coconut mixture evenly over brownies. 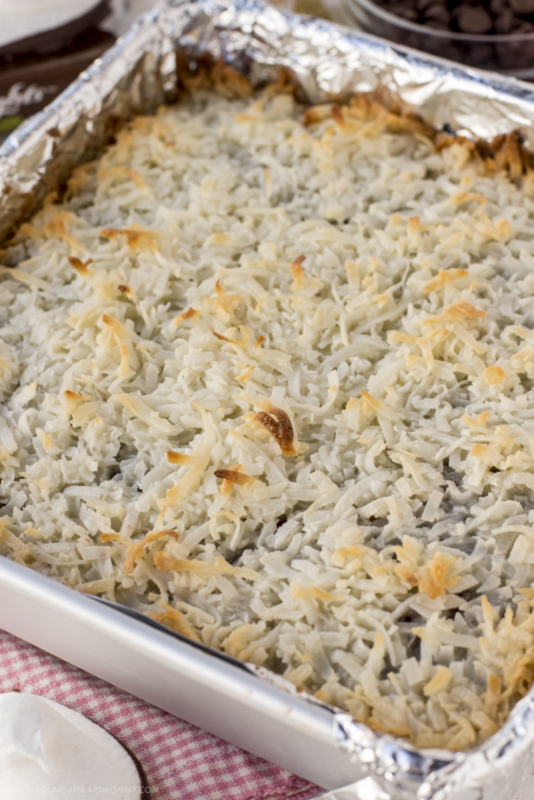 Bake 14 to 17 minutes longer, or until coconut is lightly browned. Cool completely, about 2 hours; remove from pan by lifting sides of foil. 3. In small microwaveable bowl, microwave chocolate chips and 1/4 teaspoon oil on High 30 to 60 seconds, stirring halfway, until chips can be stirred smooth. Spoon into resealable food-storage bag; seal bag. Cut small tip from corner of bag; drizzle chocolate over coconut mixture. 4. 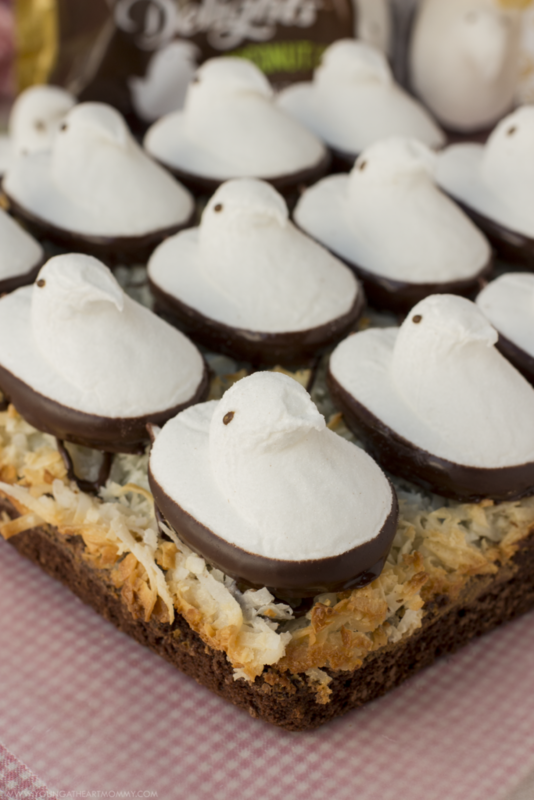 Top with PEEPS® and let stand for 30 minutes, or until chocolate drizzle is set. To serve, cut into 4 rows by 3 rows. 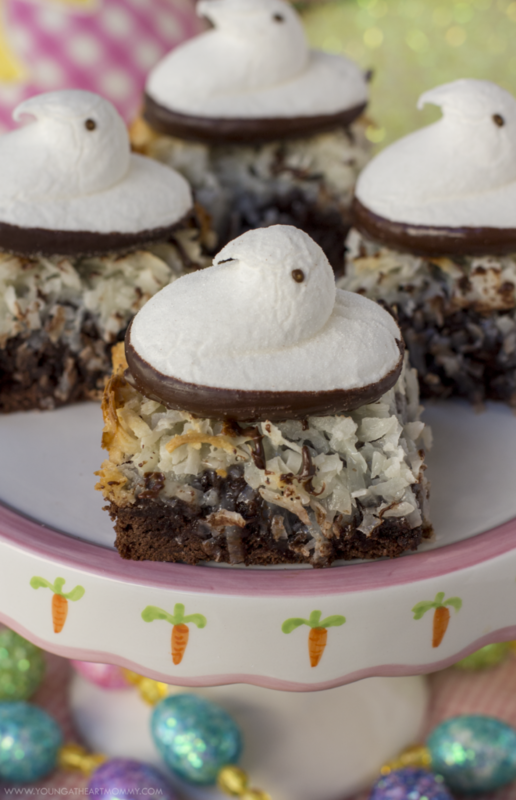 Give your batch of brownies a sweet makeover with new PEEPS® Delights™! From fresh & fruity to dreamy and decadent, these dipped marshmallows offer a delicious experience that’s sure to make you smile with every bite. They’re available in a ton of fun flavors including orange, lemon, raspberry, strawberry, vanilla, coconut, and chocolate mousse. Which is your favorite of the new PEEPS® Delights™ flavors? Me too! Coconut Macaroons from GODIVA are probably my all-time favorite dessert. Anything that combines coconut and chocolate is my kinda treat. These are literally the fanciest peep desserts I have ever seen. Way cute and cool looking, almost can't see the peep.